It’s Halloween time, and you know what that means: the ghouls, goblins, and ghosts will be emerging from their graves to scare the Omaha area! However, this Halloween, you should be afraid of much more than spooky monsters. We often forget about how much we rely on our HVAC units to make our lives easier and more comfortable, especially in a city like Omaha. Halloween marks the end of fall and the looming presence of winter. When the seasons change, we begin to use systems that haven’t been turned on for a few months. More often than not, havoc ensues, and we’re left with a broken system. Fortunately, the signs that your system is broken are easy to recognize and make diagnosing easy. If you notice any of these scary signs, contact your HVAC repair technician ASAP! In the summer, you should expect your heat pump to blow cold air. In the winter, though, the heater shouldn’t be blowing out cold air. If it is, there could be an issue with either the heat exchanger, sink, or mechanics within the unit. Sometimes, the problem is caused by the heater running as an AC unit, which is an easy fix. The issue could also be related to the valves or compressor, which could require a repair or replacement. It’s also important to note that the air should feel cold, and sometimes, people think that their heat pump is broken just because of a temperature discrepancy. If the air outside is absolutely frigid and below freezing, your heater can only do so much to heat up that air. The air pushed out is going to feel warmer if the temperature is 50 compared to if the temperature is 22 degrees. Use discretion! Yikes! The thought of not having hot water during these colder days is enough to drive anyone insane. Unfortunately, this spooky issue is common, and the signs of a broken water heater are both obvious and unavoidable. If you turn on your shower and no hot water comes out, then there’s likely an issue with the hot water heater. Today there are many types of hot water heaters, and the two most common are gas and electric. If you have a gas heater, check the pilot light. The pilot light indicates if there is gas flowing into the unit and heating your water. You can try to light it yourself with a long match or you could recruit a HVAC repair technician to do it for you. The latter is helpful because they could also diagnose why the pilot light went off in the first place. Usually, it has to do with the gas valve. A new water heater, if necessary, isn’t expensive at all, costing between $75 and $200 for smaller ones. It’s a brisk winter morning, you wake up, and the house is freezing. You recall turning the heater on the night before and are confused about the freezing home. As you inspect the causes, you soon find that the heater outside is covered in snow or ice. Engineers are smart, and they knew to install defrosting mechanism onto the HVAC units in case, well, it gets cold out. The defrosters turn on periodically to melt the ice that built up around the coils and valves. If they break, then your heater is likely going to freeze over, especially if it’s freezing outside. This isn’t something that you could repair on your own and you’ll want to have it fixed ASAP. Under no circumstances should water be leaking from your unit. Usually, people experience leaking water during the summer from their indoor air conditioning unit. If the water is condensing improperly or there is an issue with the coils, water that should be fixed inside the unit is seeping out. Water leaks could also be a symptom of issues with heaters and humidifiers. 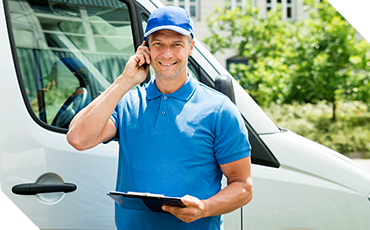 If you spot leaking, call your HVAC repair technician for a diagnosis and solution. You can probably recognize the bad odor that comes out of your unit after you turn it on for the first time in a while—that’s usually normal and will go away after a little bit of usage. However, if this odor persists or you recognize other odors, then you might have an issue. Let’s start with the most dangerous odor: the smell of gas. If you detect a gas smell coming from you heater or hot water unit, then do not light any flames and open up doors and windows. Call your gas company ASAP. 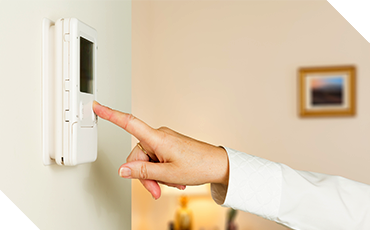 If you detect a burning odor coming from one of your units, there could either be an issue with something pressing up against the heater and melting or a wire overheating and burning. Turn the unit off immediately and call a technician! Going back to that musty smell that you notice when you first turn on the unit: if it persists, then you could have an issue with either an air leak or dirty ducts. Both of these are easy to fix, thankfully. 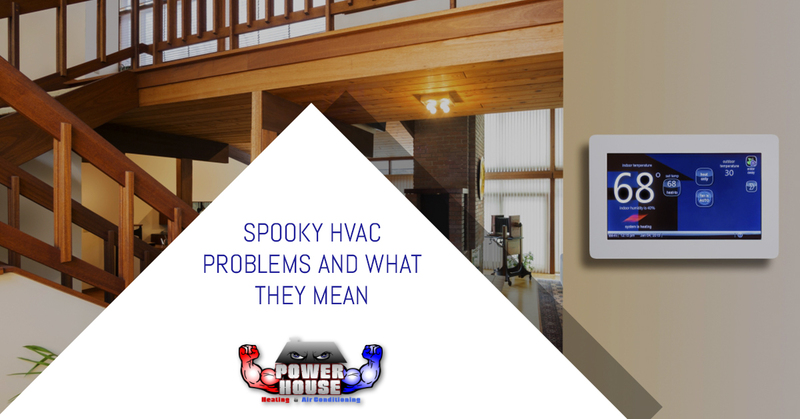 Don’t be spooked this Halloween by a broken heater or air conditioner. If you’re in the Omaha area, don’t hesitate to contact the HVAC repair contractors here at PowerHouse! We’ll send a reliable technician over to solve the problem right away.